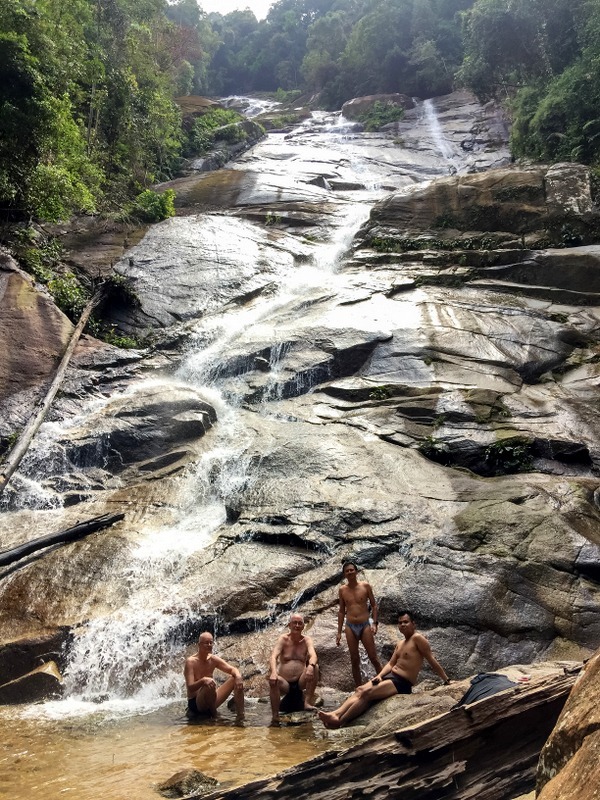 During a recent stay in Taiping I have revisited two waterfalls, the Maxwell Hill Fall and the Kamunting Fall. Here is a GE map of the region with my GPS data. It was the Maxwell Fall she saw and admired, although she was wrong in her estimate of the distance, which is about 1,5 mile. You can still see the fall from the Lake Gardens. 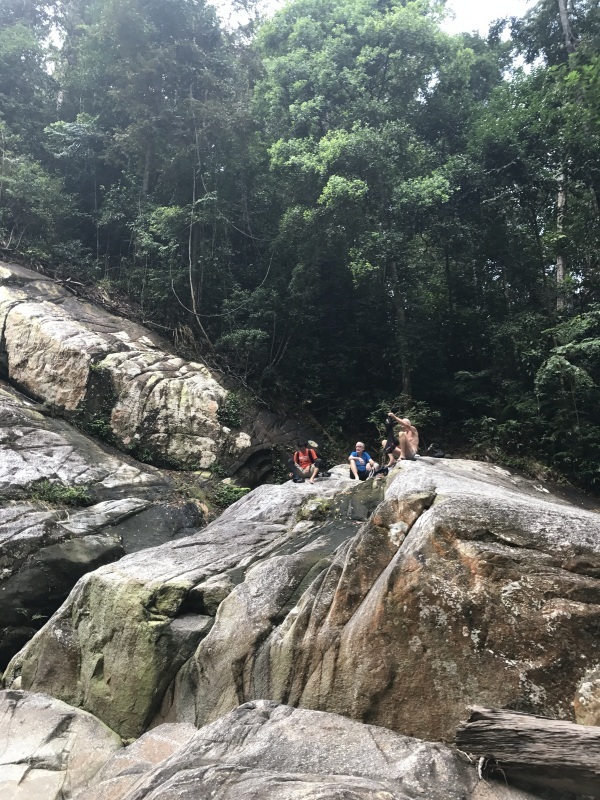 The Kamunting fall is visible from Taman Bukit Emas. The trail head for both falls is the same. It starts from the water treatment plant. Until a few years ago you could follow the tar road until the gate, where the trail started. Nowadays the last part of that road is out of bounds, an alternative trail starts just after the bridge near the Indian temple. 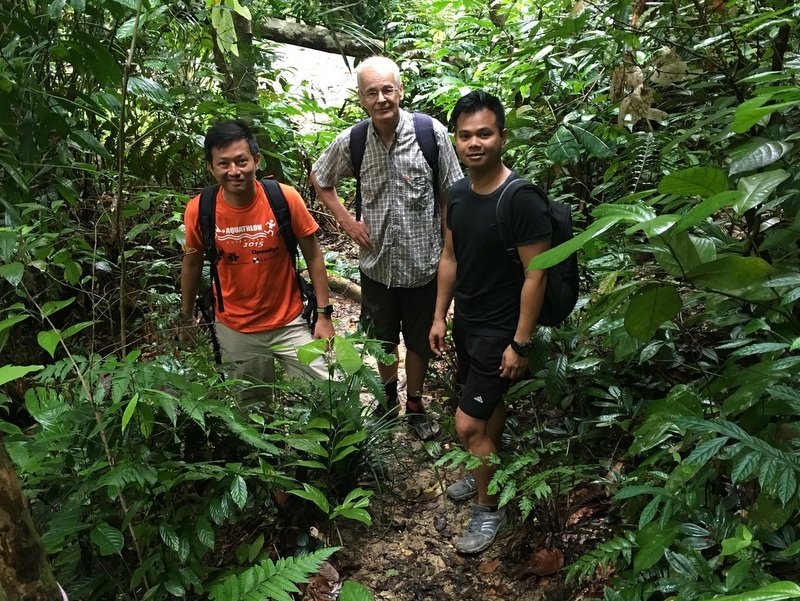 Here are my buddies Aric, Paul and Fahmi at the trail head. It is quite a step climb, ropes come in handy. Steep but not far. 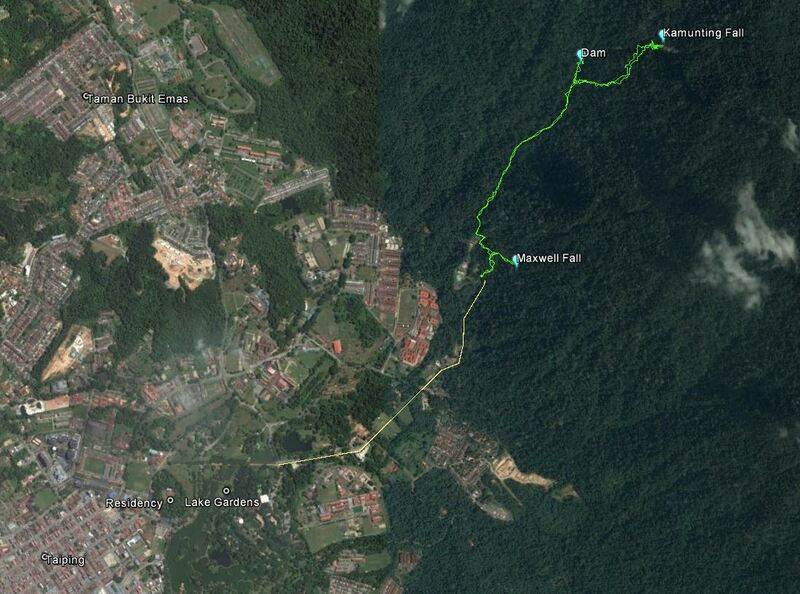 Soon you reach a wider trail, where you can turn right to the Maxwell fall, only a short distance away. 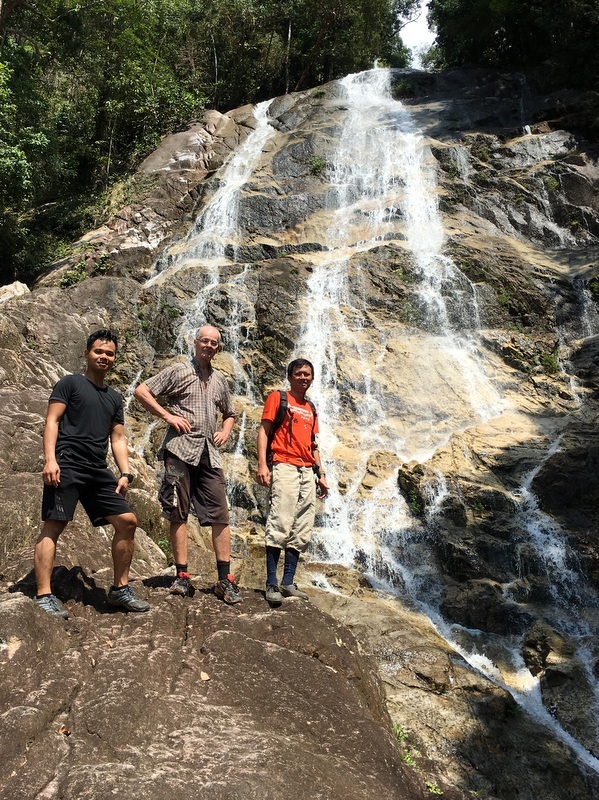 We decided to visit the Kamunting fall first and turned left. You have to skirt the fencing of the water treatment plant, and be careful with the barbed wire. 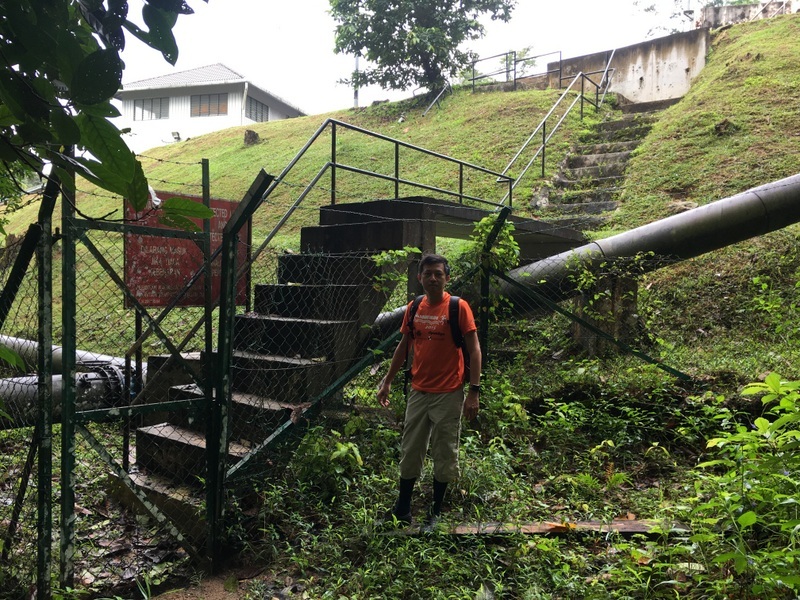 But after this part you reach a beautiful, romantic trail, next to a pipeline that transports water from a dam in the Ranting river to the plant. Pure bliss. 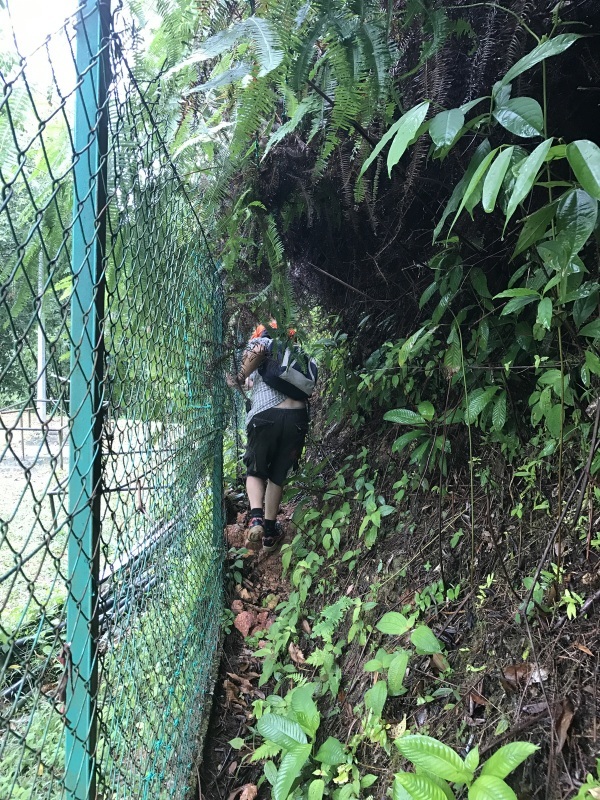 About one hundred meter before reaching the reservoir, you can see a rope leading up a steep slope to your right. Here ends the easy part of the hike…:-). 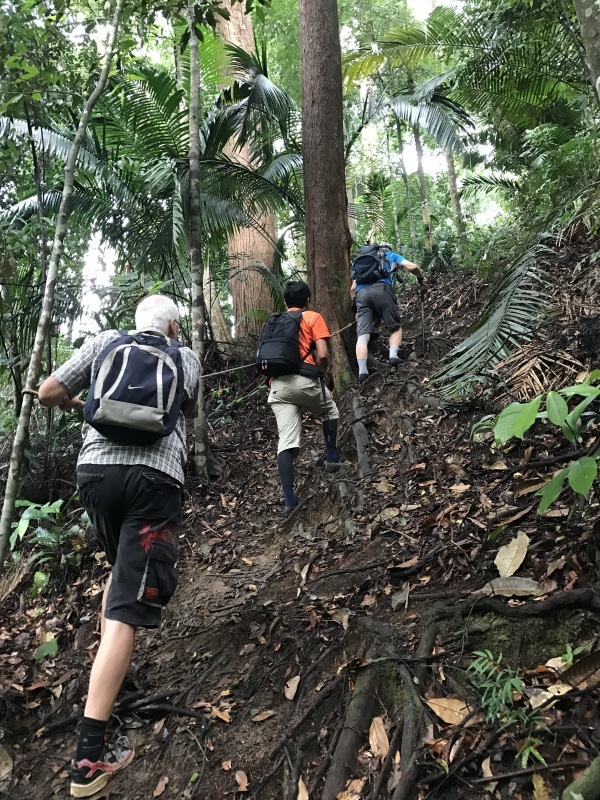 You have to scramble up the slope, fortunately it had not rained. Many ropes and also clear markers. Too busy scrambling to take pictures. 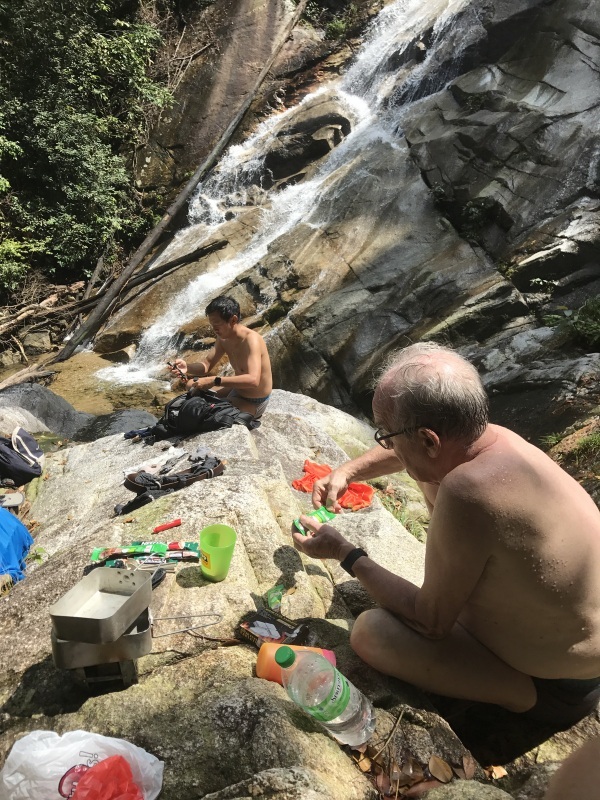 After the steep slope, the trail levels a bit, you will hear the sound of falling water and soon your each the waterfall. 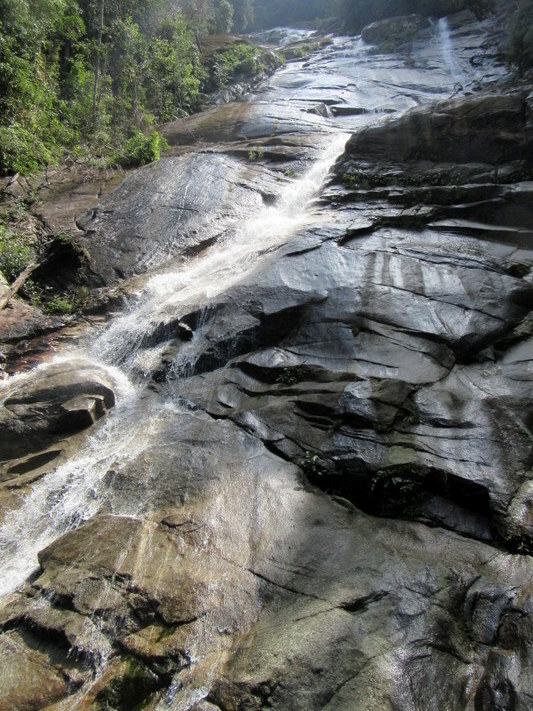 It is a tall cascade, the rocky face is visible on Google Earth. Not a lot of water this time, but still quite impressive. 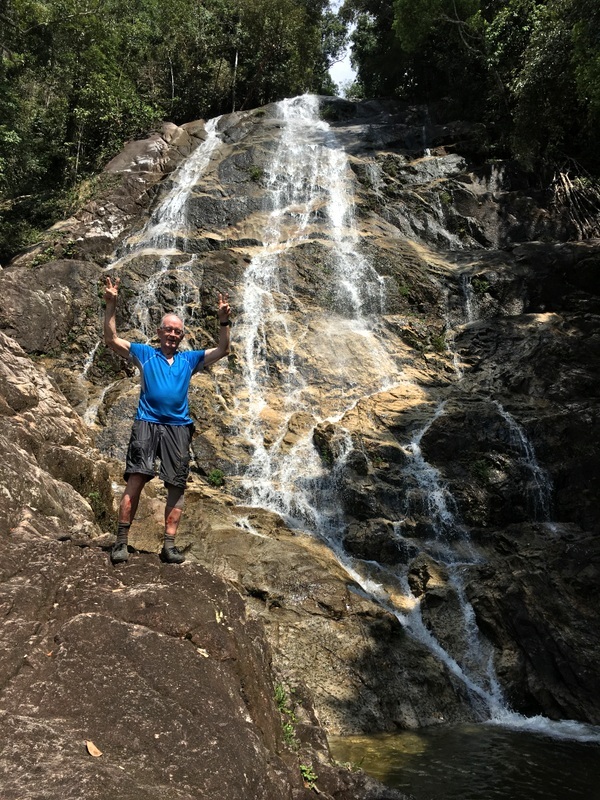 Here is a short video of the Kamunting fall. Actually I don’t know if this is the real name of the fall. The river is the Sg Ranting, so the name could also be Lata Ranting. Aric installed his tripod and with his remote he was able to take a picture of the four of us. One for the album, in my opinion. Then it was time to go back. Now that we had reached our target, I felt more at ease and took some pictures. After we had scrambled down the slope, we had a look at the dam, where the pipe line started. The trail also stops here, we did not explore further, but walked back. Don’t visit this fall if you are afraid of leeches. There were many..:-). 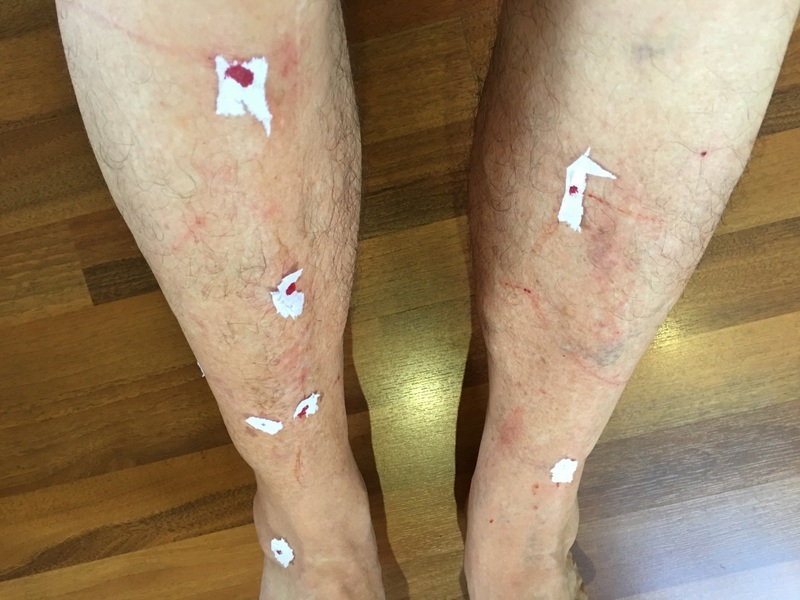 To stop the bleeding, a small piece of tissue paper is very effective. When we reached the trail going down to the road, the Maxwell Fall was so near that we decided to have a look. Here it is. Also here I took a short video. 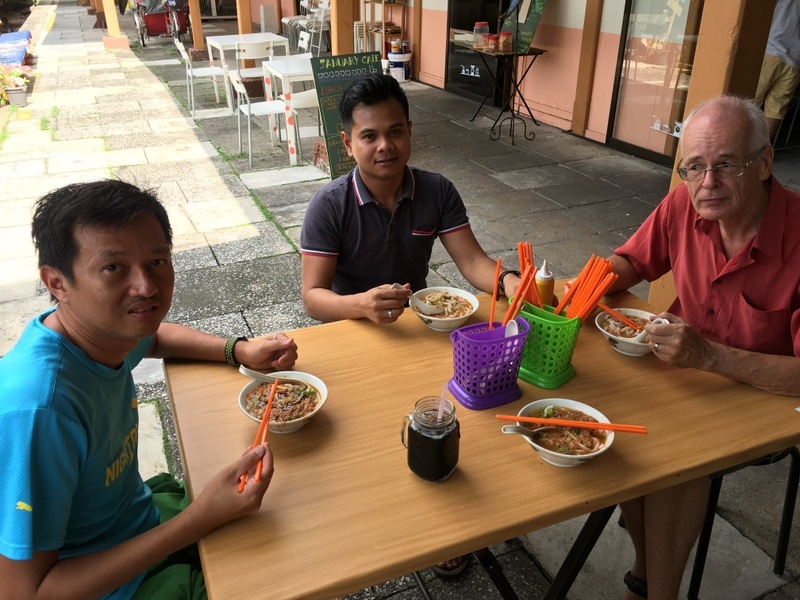 We ended this successful waterfall hike with delicious assam laksa and cendol at a stall in the Old Railway Station, one of the many heritage sites of Taiping. 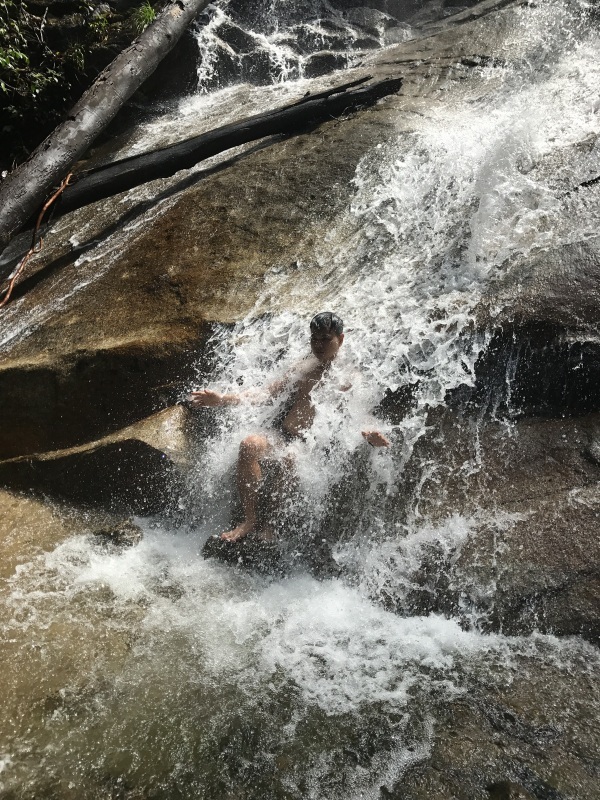 This entry was posted in Malaysia, Waterfalls by janstu. Bookmark the permalink. Glad to see Isabella is still influencing your outings!!! 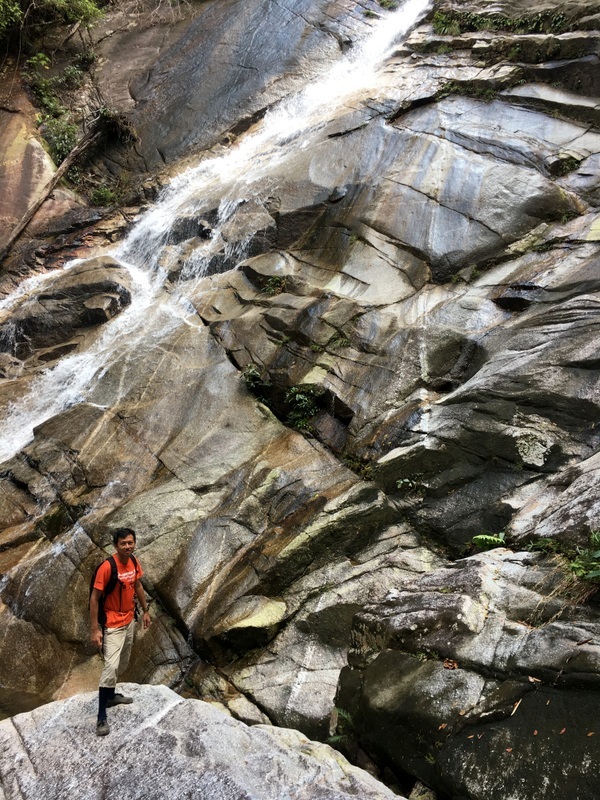 How long would it take from the starting point to maxwell waterfall? Less than half an hour. Distance only about 400 meter, but the first part is steep.